Apprenticeship programs are appropriate for anyone who wishes to improve his or her professional qualifications profile and who is sponsored by an employer or can find an employer that is willing to provide sponsorship. Most of the training (80 to 90%) is provided in a workplace where the apprentice has the opportunity to master skills related to his or her trade under the supervision of qualified personnel. The theoretical component of the training is generally provided by a community college in classrooms or through distance education. A potential employer must contact a counselor in a MTCU apprenticeship office to register an apprentice. To obtain a list of counselors in your region, please visit http://www.findhelp.ca/mtcu/appoff_fr.html, and to obtain general information, please refer to the Ministry website at www.edu.gov.on.ca. Find a sponsor: an employer who is willing to supervise your hours of practical training. Contact the office of the Ministry of Training, Colleges and Universities nearest you or visit the Ministry website at edu.gov.on.ca to find the office nearest you. For further information or for help with registration, please contact the Office of Admissions and Registrar at 1.800.361.6673 ext. 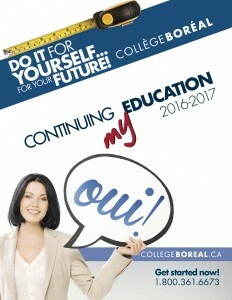 3003 and ask to speak to an admissions officer or send an email at : apprentissage@collegeboreal.ca.